Apple Watch is a health and fitness companion with intelligent coaching features, and water resistance, that is now integrated with the UnitedHealthcare Motion wearable device program (Photo courtesy of Apple). UnitedHealthcare Motion is a national wearable device program that has encouraged people to collectively walk more than 235 billion steps and earn nearly $38 million in rewards. (Source: UnitedHealthcare). 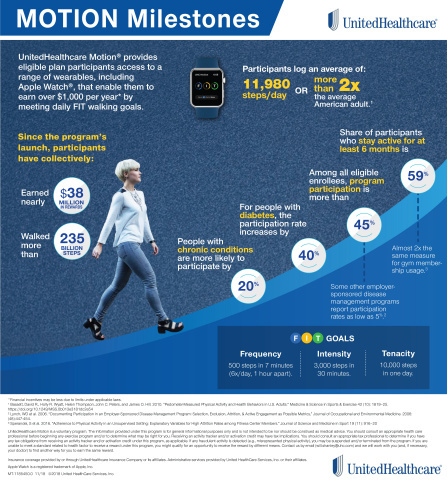 MINNETONKA, Minn.--(BUSINESS WIRE)--Apple Watch is now part of UnitedHealthcare Motion, a national wearable device program that encourages current participants to achieve nearly 12,000 steps per day* – more than double the number of the average American adult1. 2 Lynch, WD et al. 2006. “Documenting Participation in an Employer-Sponsored Disease Management Program: Selection, Exclusion, Attrition, & Active Engagement as Possible Metrics.” Journal of Occupational and Environmental Medicine. 2006: (48):447-454. 3 Sperandei, S et al. 2016. “Adherence to Physical Activity in an Unsupervised Setting: Explanatory Variables for High Attrition Rates among Fitness Center Members.” Journal of Science and Medicine in Sport 19 (11): 916–20. Apple Watch is now part of UnitedHealthcare Motion, a wearable device program that encourages participants to achieve nearly 12,000 steps per day.